The Silver Chair Pre-Production in 2017? Douglas Gresham (producer, stepson of C.S. Lewis) gave an update on The Chronicles of Narnia: The Silver Chair while speaking at the Logos Theater in Taylors, SC yesterday. NarniaWeb spy ‘Hogglestock’ attended and sent us a rundown. For the fans that love the famous speech Puddleglum gives after stamping out the queen’s fire… “We’ve got that in the movie,” Gresham confirmed. * “Pre-production” usually refers to the phase where sets are constructed, locations are scouted, actors are cast, costumes are designed, and the filming schedule is worked out. This period can last anywhere from several months to a couple years before filming begins and usually starts after a director is announced. If the current plans pan out, we would speculate that late 2018 is probably the earliest the film could release. An official release date and director have not yet been announced. View the production timeline for The Lion, the Witch and the Wardrobe here. Discuss this in our forum and Facebook page. All exciting news. 2017 pre-production sounds about right and cutting Puddleglum’s speech would have led to protests haha. I’m a little surprised a director has not been announced yet. One factor to consider: the budget. If, as we expect, SC gets a smaller budget, it could mean a shorter production timeline. So, LWW might not be the best comparison. We’ll see! David Magee said on Twitter, that the budget will be the same as the previous films. Also, what he said on twitter is that he ASSUMED that the budget would be the same, simply based on the previous films. So exciting! This is like an Early Christmas Present for Me! I don’t need anything else for Christmas now! Also, yes, agree the PG’s speech is really important. All very good things to hear, especially the bit about Puddleglum’s speech making it into the film. And now I have learned a new word: corker, someone or something that is astonishing or excellent. Let’s hope that it is, Mr. Gresham! I’m also really heartened to hear Gresham praise the script so highly… even though the moratorium seemed like such a bad thing at the time, I’m starting to feel like it might be the best thing that ever happened to a Narnia movie. It’s given the C.S. Lewis Estate so much time to develop a script that’s truly worthy of the story, as well as enough time to structure contracts in a way that gives them the oversight they need to produce a great film. I know it’s early, but I can’t help but be optimistic! Great! At last the Silver Chair movie is beginning to look a reality. No way "Aslan Return" (lovely name ! lol) ! I have read all the books and I can tell you that in this next one, there won’t be Peter, Susan, Lucy and Edmund !! David Magee tweeted about two weeks ago now that they were "going full steam ahead", and he seemed pretty confident that this would be in pre-production soon. Now Douglas Gresham is making me even more excited! We have never been able to officially verify David Magee’s twitter account. It may or may not be him. Take everything you read on there with a grain of salt. YAY!!! I’m so happy all I wanted for Christmas was some SC news and now I have it. Thanks Santa! It’s happening. It’s actually happening. Hey, that’s a clever way of thkinnig about it. David Magee did Tweeted about it and he did say that it may get filmed in early or Mid 2017 and the release date would be xmas 2018. If it’s then I’m thinking December 7th, would be the when we’ll see it. I made a wishlist for what I would like to see in the movie and some of these might not happen. 1- have Jill use a bow and arrow. That’s the only thing that annoyed me in the BBC Adaptation. She might not use it a lot but I’m she’ll at least have one in this version. 2- have Jill try and fight the Green lady. 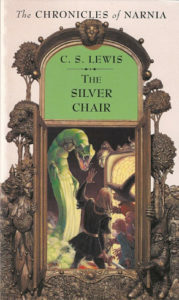 I watched a play of the Silver Chair and the green knocked the boys down and Jill is the only one standing and the green lady was telling its not real, it’s all a dream and Jill refused. She tried to fight her but failed. She might not a sword but use a bow and arrow. 3- have the Chair itself a red or a green cushion. If you look a the early 2000s cover the chair had a red cushion. I did an artwork of how I envisioned it. It’s very similar to the Pauline Baynes Artwork except less spiky and more curved, I gave it a green and black cushion and on top of the back rest is a small cobra head with tiny emerald eyes. 4- have children actors, cause Narnia is mostly a children’s story. And if they have them as background characters at like Cair Paravell or at Harfang, that would be great. 5- Have the Opening Credits be like in the first 2 films. I was surprised they didn’t do that in vdt, I am hoping that maybe they’ll extend it at a part where Jill or Eustace is on his or her way to school. 6- MAKE THE SCORE SOUND MAGICAL. That’s what got me into Narnia in the first place. I’m very munch hoping that Harry- Gregson Williams will come back. 7- have Aslan’s Roar at the end. How i see it is after Jill and Eustace go through the broken gate, they turn around and see it fully repaired, then they walk away and the door would open a Jar and Aslan Roars. What a lot of enthusiastic comments! I too am delighted to know that Mr Gresham is so pleased with this script. I’m looking forward to hearing more details of production, such as where it will be filmed, and who the director will be! Wow, this is some exciting news! Still it could take a while if they don’t get a director soon. Crossing my fingers that we get a crew going soon and I can’t wait to see the cast. Maybe the Opinion Poll should be changed to a few directors we think might be great for The Silver Chair. On his Twitter account David Magee states that they are keeping all ages roughly the same as the book, so that rules Will Poulter out I’m afraid. However there is still absolutely no reason why they couldn’t have Ben Barnes, Peter Dinklage and Liam Neeson back. I can see this one good scene come to life on screen, the scene after Jill And Eustace arrived in Narnia. They close the gate, they turn around, they walk forward and the camera pans around them to their backs and they and the audience see the trees and the birds, like one in the illustration except not from above. I can see that happening. I think the scene was best done with Tom Baker in the old BBC Narnia series. It is gratifying to know that this part of the book will not be left out, but who knows how well the actors playing Puddleglum and the children will do it? The scene with Lucy seeing Aslan while he remained invisible to the other children was left out of the Disney Prince Caspian movie. There would be no point in repeating a big mistake like that in the new film. Puddleglum was showing his great faith in Aslan and Narnia so why shouldn’t they leave this event intact as it was in the book? Look at this – 6 THINGS THAT SHOULD BE REALIZED IN THE FILM "THE SILVER CHAIR". In this video is about Andrew Adamson, Will Poulter, and Harry Gregson-Williams. Can someone please tell me why they didn’t make the Magician’s Nephew or The Horse and His Boy?!?! Well that answered my question a whole ton. This is the order in which C.S. Lewis wrote and published the books. Also, it would still show the characters’ stories as they age. That is, the actors won’t have to go back and film a movie where their character is younger than in the one they had already filmed. If they don’t get to The Horse and His Boy for another 10 years, they could still use the same actors for Peter, Susan, Edmund, and Lucy because they had been kings and queens in Narnia for some time during that story. Give Mel Gibson the director chair for the upcoming SC film, he will do it well.